Another day of clouds but I added a mountain. I’m finding that I like using chunks of glass and shaping them. It’s less tedious then glueing down a million little squares and I like the way it looks. 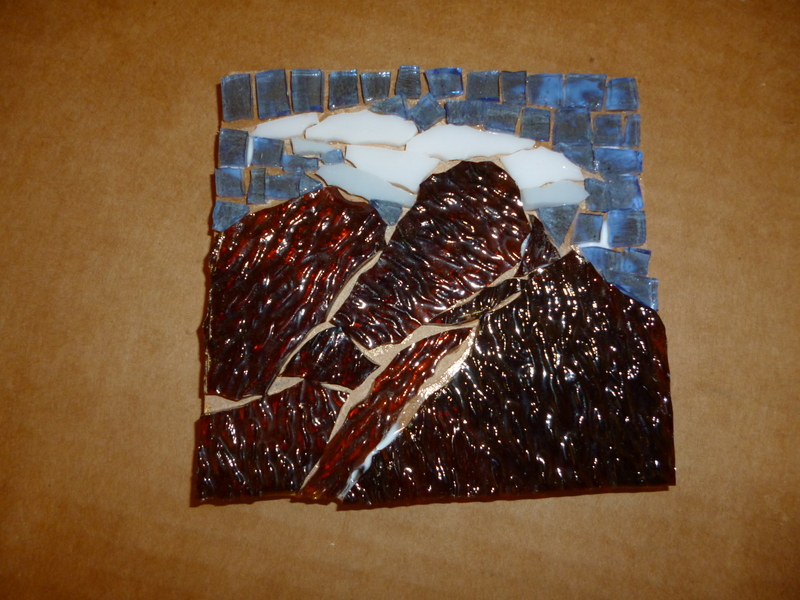 I used this great textured glass that gives the mountains some dimension. I’m starting to get into a routine already. Late in the day I start thinking about the design for the day and do some drawings. I go right to work as soon as I get home. Even if I’m tired before I start working I feel energized as I work on the mosaic. It’s a great way to forget about everything for a while. I love seeing the end result and writing about it. I’m feeling comfortable with the decision to create a mosaic 6 days a week. I’m excited to grout on Sunday and see how the completed mosaics look.